Quinoa, kale, almond flour, spaghetti squash… You name it, chances are I’ve tried it, liked it, made food with it. It’s amazing how easy it is to substitute any of the above foods for bread, pasta, or flour. I’m always on the lookout for new ways to incorporate healthy foods into my diet and put a spin on traditional recipes. Thank God Trader Joe’s exists to provide quirky foods and recipes that satisfy my curiosity! My latest venture, courtesy of the Joe? 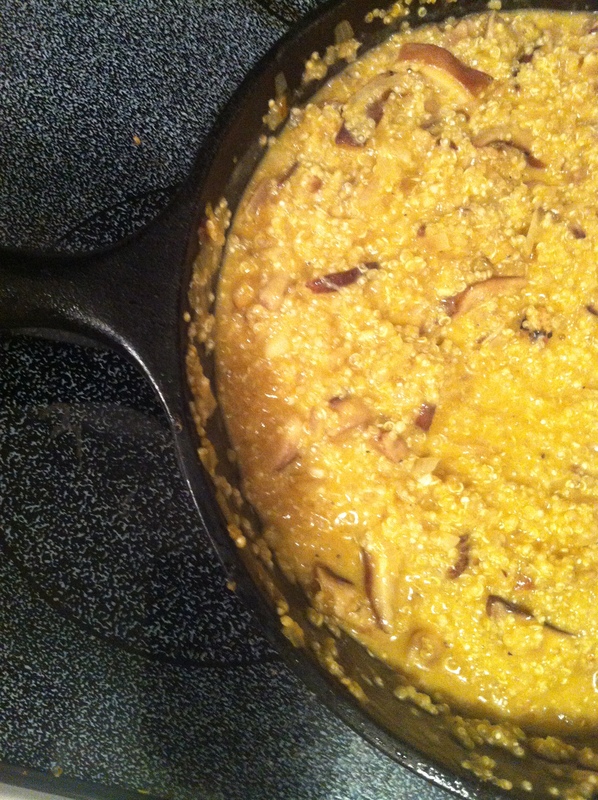 Quinoa Risotto with Shiitake Mushrooms. I’ve actually never had risotto, much less made it, so this cooking experience was an adventure. 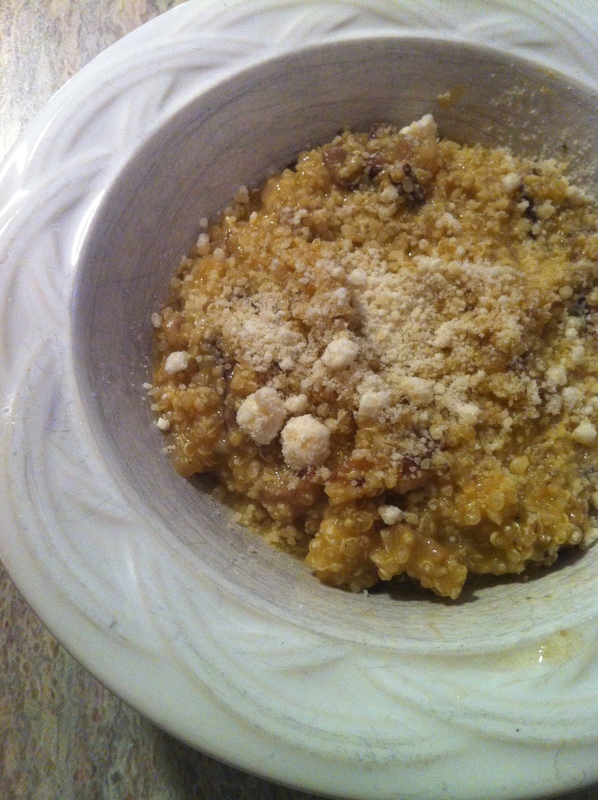 The idea came to me rather organically (no pun intended) via a recipe on the back of Trader Joe’s Organic White Quinoa. I’ve wanted to make risotto for a while and reasoned that TJ’s recipe was as good as any to try. (I unabashedly trust anything TJ’s sells or tells me.) As usual, Trader Joe’s did not disappoint. I’m no risotto expert, but if we’re calling this my first introduction to the dish, then call me a believer. Try it for yourself! “In a large skillet heat the olive oil over medium heat. Add the Sliced mushroom and sauté until golden and soft, about 5 minutes. Remove from skillet and set aside. Lower heat, add shallot and garlic to pan and sauté slowly until they begin to soften and become translucent, about 5 minutes. Increase the heat to medium high and add the quinoa. Stir for about 3 minutes until the quinoa is coated with oil and slightly toasted. Lower the heat to a simmer; add the wine and continue to stir until it is absorbed. Once the wine is absorbed pour about 1/2 cup of warm broth into the quinoa and continue to stir and simmer until it is completely absorbed. Allow pan to almost dry out between additions of broth. 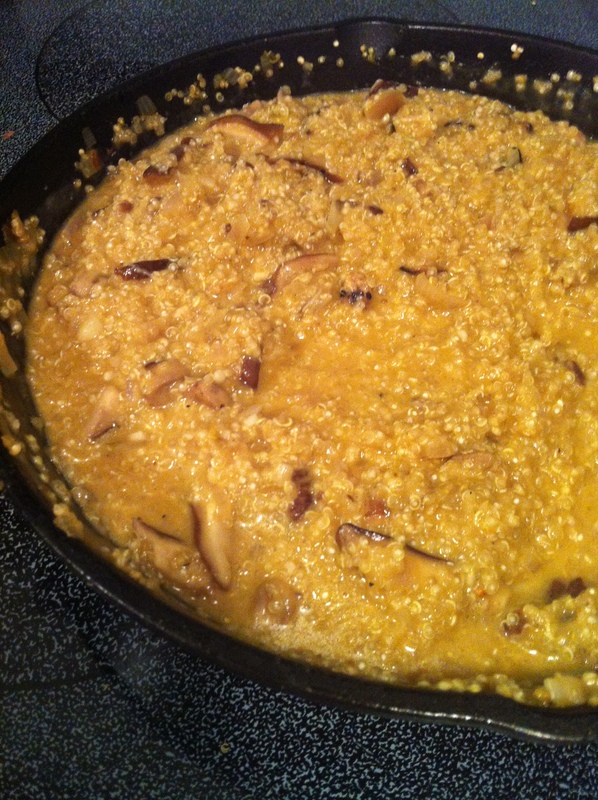 Keep stirring in broth 1/2 cup at a time until the quinoa is creamy and the quinoa germ has burst, about 20 minutes. Taste for doneness (should be creamy and a little al dente) and add salt and pepper to taste. Original recipe can be found on Trader Joe’s Organic White Quinoa package. It sounds like a good way to get more shiitake mushrooms in my diet. We buy ours dehydrated then rehydrate to use. Thanks for the post. Thank you for posting. We made this from the package recipe a long time ago and loved it! I was so thankful you posted it. Lost our empty package in a move. Delicious! This is awesome. I tried it last night, with baked chicken, and people took seconds! Delish!